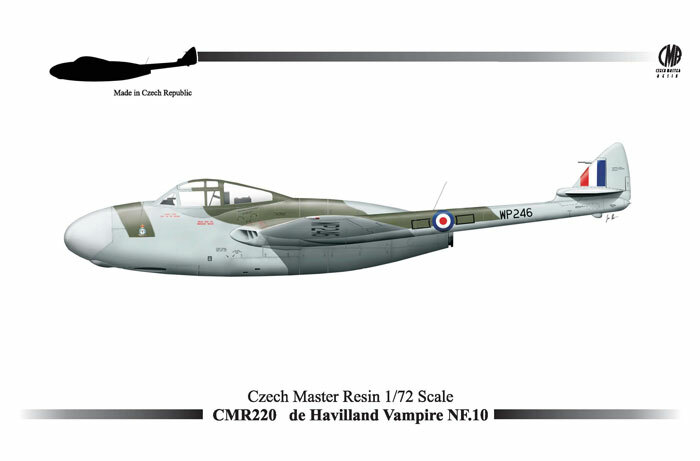 CMR has just released a new two-seat Vampire kit, the NF 10. Until recently CMR has been busy issuing new kits if various single-seat marks, so it is nice to see them turn their attention back to the two-seaters after several years. Considerable research has gone into this kit, providing for the sometimes surprisingly subtle variations between the various marks of Vampire. This new hi-tech release is a true multi-media kit with both pre-coloured and plain Eduard photo-etch details, and pre-cut paint masks. For more information on kit contents, colour schemes and assembly diagrams etc please click here. These kits will be on store shelves any day now, see these on-line stockists for any orders you may wish to make. This kit will be on store shelves any day now, see these online stockists for any orders you may wish to make.